It takes a lot of energy to produce this monthly survey of the comments on the blog. I'd really appreciate feedback from anyone who feels strongly one way or the other about this section of the newsletter. Is it useful or interesting to you? Comment aficianados are reminded you can subscribe to the comment RSS feed to get your daily fix. February was a busy month for comments on the blog, making up for a quiet January. Msot of the comments came as part of long threads of deep discussion on a few core articles. The discussion on "ITIL vs. COBIT, ISO20000 et al" was an active one, including the part about itSMF's role. Lots of comments about the best ways to buy the ITIL V3 books... and about errors in diagrams. "Implementing ITIL" kicked off a great (and extended) discussion of what works, what maturity is, and costing. Another good debate was around a layman's definition of ITIL - we really struggle to come up with a pithy definition that means something in plain English. And another good chunky conversation about Don Page's guest post on ISO20000 - brisk deabte from both sides on the value and apllicability of ISO20000, and interesting thoughts about ISO20000 individual certification. My People Process technology variant caused a interesting discussion on what models are in the ITIl books, and on people as the key factor. The question of multi-choice questions caused debate around whether it is the British education system's fault which led into real ongoing professional certification. See also this thread for more on multi-choice. Two thoughtful comments about getting management commitment. One of the "meatiest" discussions was about how to treat hosted applications in the ITIL service catalogue - just how do you define "application" anyway? It also ended with the (unintentionally) funniest comment we've had in a while. Here's one that a colleague wrestled with recently at a client site: how to treat hosted applications in the service catalogue. Firstly I love reading ITIL Sceptic; the passion, expertise and honesty of individuals, the stupidity and self interest of others. As one of ITIL's biggest supporters and critics I have reached a stage where I am very frustrated with the whole “ITIL journey”, its hype; its promised outcomes. How can we speak of implementing ITIL or measuring the results of ITIL if ITIL ought to be an ongoing (unending?) process of continual service improvement? A podcast of the original blog post: Which is the best way to buy ITIL version 3: as books, PDFs or online subscription? The IT Skeptic makes a choice. A podcast of the original post itSMF and ISACA: like chalk and cheese. If you missed this month's edition of the Skeptical Informer, you missed some scuttlebutt about why the itSMF International website has hastily gone off the air. The circus continues - all part of an endless litany of mis-management, spats, dodgy deals and mis-governance through 2007. Multiple-choice exams test how well someone can do multiple-choice exams. Depending on how well written the qustions are, they might also test some understanding of the topic ... or not. With good technique you can get a pretty good score with limited knowledge. The Official Introduction to the ITIL Service Lifecycle is a great book, very useful. It is the book that ITIL Version 3 needed. But now there is another official book produced by OGC that may just be a better place for ITIL Version 3 beginners to start. Regular readers know the IT Skeptic is a big fan of the People Process Technology model for approaching any IT change/innovation/project. It is a model that seems to be honoured in the breach - people mostly ignore it. Maybe we can tweek it a little to get it to stick? 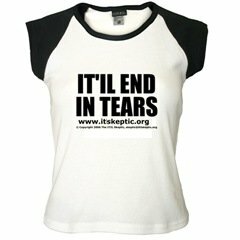 After several other opportunities fell through in 2007, the IT Skeptic will finally appear in public for the first time. Recovering from the embarassment of their previous host withdrawing services, the itSMF International has launched their new website after a couple of months of a shaky temporary arrangement. itSMF International announce the election of Ken Wendle (HP, USA) to the seventh position on the Executive Board, defeating Pauline Angelico (Itilics, Singapore). The old school wins over fresh ideas. What do the IT Skeptic readers feel about the ITIL v3 exams? We polled you to find out. IT initiatives fail so often because of lack of management commitment, support and leadership. What to do about that?